Well hello. It’s been quite some time, hasn’t it? My explanation is simply that I thought I’d be smart and take two literature and two writing classes this semester. It was not smart. I spent the last four months reading anywhere from 400 to 500 pages a week, and constantly writing and revising stories and essays. I worked in Career Services before and after all of my classes. 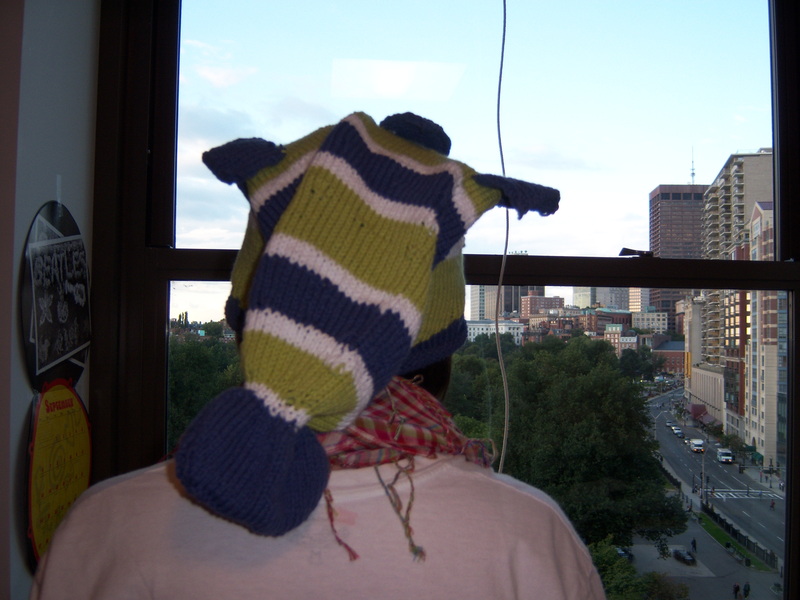 Any spare time was spent knitting while hanging out with the girls and the guy I live with. Needless to say, there was no time, and even less desire, to write even more. Thus, the blog was neglected. The good news is: a) I’m only taking one literature and one writing class after winter break, plus two electives, leaving much more time for other activities, blog included; and b) I finished quite a few knitting projects since my last post. I’ll post them one by one over the course of the next few days, to preserve the sanity of everyone. 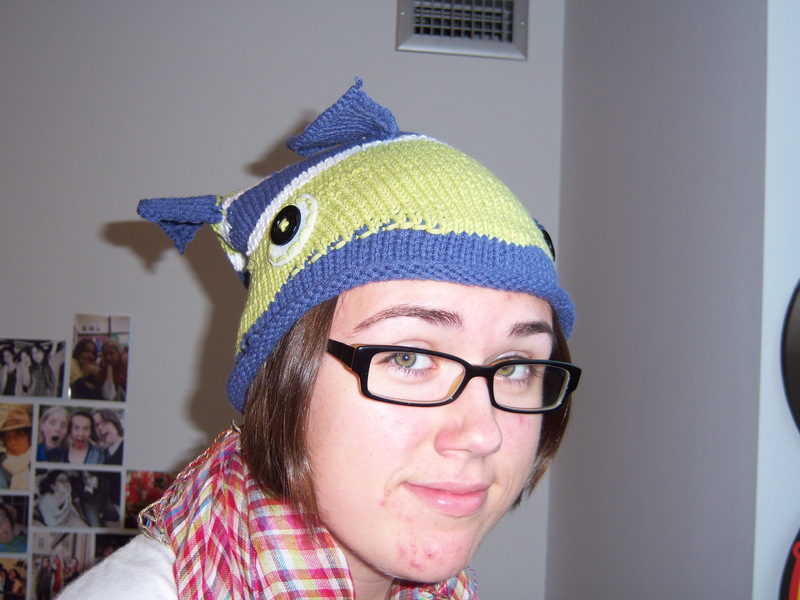 Let’s start with the fish hat I made for my friend Casey back in August (jeepers, I’m a bad blogger!). So cute! She promised me if I made it for her, she would wear it. That’s yet to happen, but winter is still young. 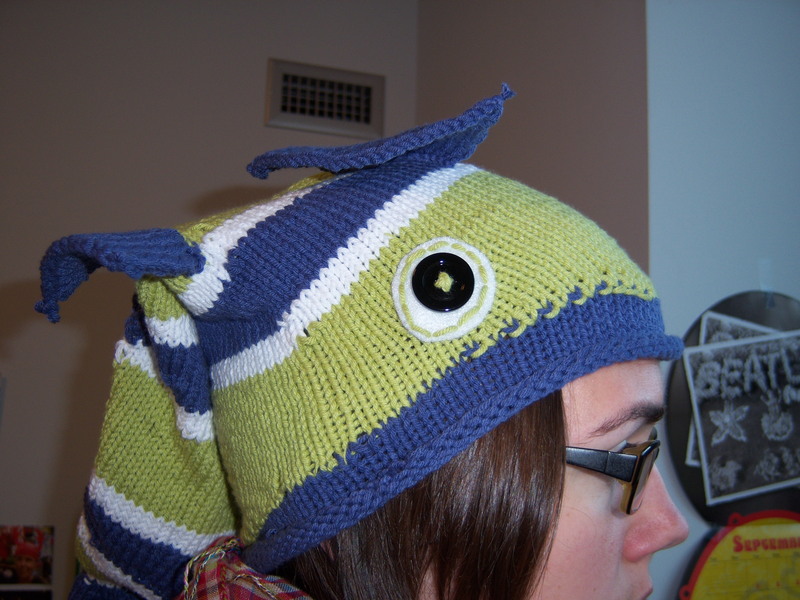 It was fun to make, what with color changes and short rows. I would make it again, if for no other reason to try out different patterns and colors, but I don’t think I know anyone else who will agree to wear it.